Dual monaural USB DAC / network player that combines latest digital audio and network technology cultivated over many years into a compact A4-sized enclosure. 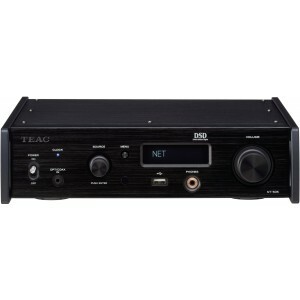 TEAC NT-505 Network Player, like the NT-503, has a dual monaural configuration that handles stereo signals in a more pure state. It supports high-quality audio streaming services such as TIDAL and Qobuz and is Roon ready. Bluetooth and LDAC make it capable of high-resolution quality wireless playback from smartphones and DAP (Digital Audio Player). NT-505 is a compact high-spec USB DAC / network player compatible with the next generation high-resolution sound source. The DAC chip "VERITA AK4497" by Asahi Kasei is installed on each of the left and right channel. It is the latest flagship DAC compatible with maximum DSD 24.5MHz, PCM 768kHz / 32bit. It achieves the industry lowest distortion ratio. Furthermore, OSRD (Over Sampling Ratio Doubler) technology has greatly reduced out-of-band noises and obtains delicate articulacy ideal for high res source that processes beyond audible range. TEAC adopted a deluxe circuit with a consistent dual monaural configuration ranging from the power transformer to the power supply circuit, the DAC section, and the analogue output stage. The dual-monaural configuration which has two circuits with stable current supply capability is reciprocally based on L/R channels and prevent interference for a rich musical expression. In addition, full balanced transmission of analogue output signals of L / R from DAC to the final output stage contributes greatly to the improvement of S/N and expansion of dynamic range. NT-505 connects to your home network via LAN cable and accesses music files saved on NAS music server or PC. It supports TIDAL and Qobuz service online enabling access to tens of millions of songs with lossless CD quality (44.1 kHz / 16 bit). It also complies with Roon so you can use DAC comfortably with network control without damaging the quality of the high resolution source. To obtain an analogue waveform closer to the original sound, NT-505 supports high sampling rates such as DSD 22.5MHz / PCM 768kHz while controlling the waveform DAC with accuracy of minimum 5μs. A highly efficient compression algorithm allows compact handling of high res sources with huge file sizes. In addition to five kinds of PCM digital filters, two kinds of DSD digital filters are included. It is possible to select the optimum filter according to the file format or music type. Using the attached remote control, you can switch the filter with one touch and easily enjoy the difference in nuance of delicate sound of each filter. In addition to the LDAC codec that delivers audio data with a sound quality equivalent to high resolution; it also supports Qualcomm aptX HD and general-purpose codecs such as AAC, Qualcomm aptX, SBC etc. You can enjoy high-quality wireless playback easily from Smartphone or DAP (Digital Audio Player). USB audio is not synchronised with the unstable and noisy computer's clock, but via USB asynchronous transfer method that conveys PCM and DSD data in synchronisation with the high-precision crystal oscillator. There are two types of dedicated clocks, 44.1kHz and 48kHz, and by applying an audio grade crystal oscillator featuring low phase noise to each input signal, the influence of jitter on sound quality is greatly suppressed and the original sound is faithfully reproduced. With the "RDOT-NEO" (Refined Digital Output Technology NEO) using the fluency algorithm to smoothly complement the digital audio signal, it has the function to up-convert the PCM digital signal up to 384kHz and the maximum DSD 24.5MHz. When sending a huge amount of digital data of a high-resolution sound source with the USB cable, USB transmission technology "Bulk Pet" enables stable data transfer. This is attained by averaging the load on both processes. Sound quality changes with the load condition of the PC, so you are able to choose from the four pre-set transfer modes. By inserting USB memory into the USB port equipped on the front panel, you can play high-resolution sound sources up to DSD 5.6 MHz and PCM 192 kHz / 24 bit. In addition to the download file, you can easily reproduce the high resolution sound source digitally recorded by SD - 500 HR etc. A large-capacity toroidal core power transformer that supplies stable current is mounted one each for the left and right channels. In this case, the dual monaural design is passed and stable current supply is enabled for each channel without being influenced by the change of current consumption related to the other signal processing. The full-dot OLED (organic EL) display, which has a high contrast ratio and is easy to see, is adopted for the display section equipped with a 4-step dimmer. In addition, TEAC adopted a large font with excellent visibility so you can check data such as volume and input source from a remote listening position. By using the HCLD (High Current Line Driver) circuit composed of output transistors of each of the left and right channels, even at headphone output, balanced driving headphones can be connected. In addition, even when used in single-ended mode, these transistors are driven in parallel to drive more powerfully than normal single-ended headphone amplifiers. With its own circuit design, it operates in class A at normal use of headphones / listening by expanding Class A operation area despite class AB amplifier. It will be possible to derive the potential of various types of headphones including 600 Ω high impedance type headphones. By configuring all of the cabinets with a metal panel resistant to external noise, it is possible to suppress invasion of electromagnetic noise emitted from PC. In addition, the 8mm thick aluminium panel wrapping the metal chassis further from both sides prevents twisting and distortion for a strong and stable casing. The A4 size enclosure can be installed on a desk or a small space such as a sideboard. You can use free dedicated software that can easily reproduce the next generation high-resolution sound source such as DSD 22.5 MHz or PCM 768 kHz / 32 bit from Windows or Mac. The dedicated software ensures no troubles with the audio setting. NT-505 can be used as a high quality preamplifier by taking advantage of the excellent analogue section and abundant input line. The preamplifier circuit adopts Quad Volume Control System which uses a variable gain amplifier type volume with four independent circuits for left and right. By disposing a variable gain amplifier type volume that is processed in analogue on the audio signal path, TEAC eliminated the problems caused by routing wires such as noise entering the audio signal.